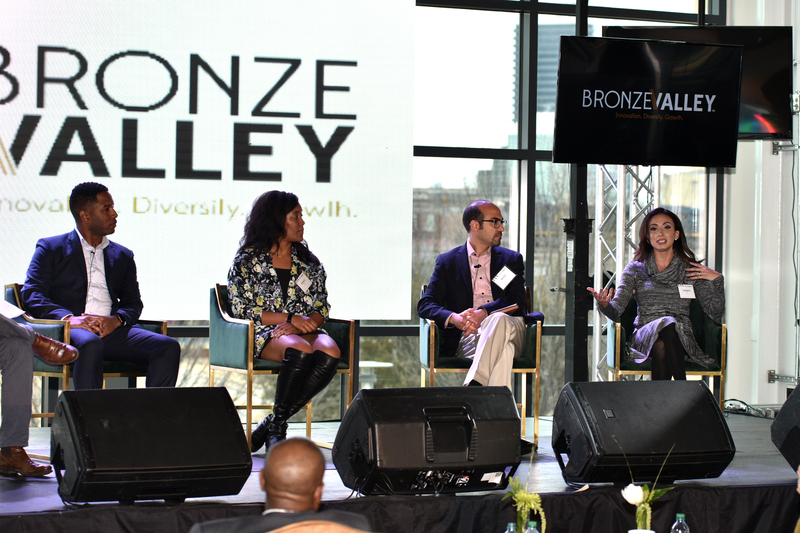 The inaugural Bronze Valley conference set a strong tone for the future of technology-based economic development in Birmingham, Alabama and the entire Southeast. That tone, and the role Bronze Valley will play, was established at the outset, in opening remarks by Bronze Valley’s chairman of the board, John O. Hudson III. “We have to act now,” declared Hudson, who is also senior vice president for marketing and business development at Alabama Power Company. “The time is ripe for this idea and the role it can play in creating opportunity, realizing potential and nurturing places where economic development and cultural progress go hand-in-hand to strengthen entire communities. Entrepreneurs discuss the successes and challenges of running their businesses on Wednesday, February 14, 2018 at the inaugural Bronze Valley conference. On the panel, from left, are Sterling Smith, Founding Partner, Sandbox Commerce; Ashlee Ammons, Co-Founder and Chief Operating Officer, Mixtroz; Dr. Mazi Rasulnia, Co-Founder and President, Pack Health and Yazmin Cavale, Co-Founder and CEO, Glow. breakout sessions and Q&As with top entrepreneurs and venture capitalists, including Kwame Anku, a leading Silicon Valley entrepreneur and co-founder of the Black Angel Tech Fund and Jared Weinstein, co-founder and general partner of New York-based Thrive Capital. Conferencegoers also attended Alabama Power’s Power of Leadership luncheon, which featured a panel moderated by broadcast journalist and producer Soledad O’Brien. Among the panel’s participants was Birmingham Mayor Randall Woodfin, who announced during the luncheon Birmingham’s selection as one of five Southern cities that will be stops on the upcoming “Rise of the Rest” seed fund bus tour organized by AOL co-founder Steve Case. The tour will stop in Birmingham on May 9 and will include a pitch competition for local startups, with the winner receiving a $100,000 investment from Rise of the Rest. Bronze Valley panel discussions covered numerous topics related to the organization’s mission of increasing the number of minority and female entrepreneurs, and optimizing the technology workforce in Birmingham, in Alabama and across the South. Included were discussions with successful entrepreneurs on how they started their companies, lessons learned and the challenges associated with moving from startup into the next phase of growth and beyond. Other topics included the role of corporations in supporting the development of the entrepreneurial ecosystem, what makes a company or idea most attractive to prospective investors and what cities can do to grow their technology sectors with purpose and intentionality. There was also a discussion with members of the Bronze Valley board, fleshing out the purpose and intent of the newly formed organization and its goal of establishing an education-to-opportunity-to-outcome pipeline for groups currently underrepresented in technology careers. The conference closed with the unveiling of bronzevalley.com. The site will provide news and information about the organization’s efforts, and other developments in tech-related fields. Ultimately, Bronze Valley’s success will be measured in real terms: jobs created; companies started, attracted and expanded; increased payrolls; improved educational attainment; and growth in minority and female employment in technology fields. More immediately, Bronze Valley executive director Neill Wright said during the conference, the organization is taking a leadership role in establishing and building out a new framework.